As the Ottoman armies advanced into South-Eastern Europe, defeating the Hungarians at 1526 Battle of Mohács, Ragusa passed formally under the supremacy of the sultan. The Ragusans bound themselves to pay the Ottomans a symbolic annual tribute. This was a shrewd move which allowed it to maintain its independence. The external policy of the Republic was directed to balancing between various world powers and states: the Ottoman Empire, the Vatican State, the Croatian-Hungarian Kingdom, Spain, France, the Kingdom of Naples and the Venetian Republic. The peace guaranteed by playing off the surrounding great powers was increased by the prosperity generated from trade. At the beginning of the Renaissance Dubrovnik had a fleet of 200 larger ships, which grew to 300 in the 18th century. The reputation of Dubrovnik mariners meant that they were at the cutting edge of contemporary voyages of exploration. The famous Columbus crew in 1492 had at least two Ragusan mariners: Martin de Araguis, Pedro de Arague. Above image: Bartolomeo Crescentio’s 1602 drawing of a Dubrovnik galleon known as the argosy. The picture is from the book La nautica Mediterranea. The word ‘Argosy’ in English derives from Ragusin, i.e. a ship from Ragusa, which was the contemporary name for Dubrovnik. The first Dubrovnik ships arrived in England in 1510 and they soon became synonymous with a bountiful cargo ship. The worldwide reputation of the Dubrovnik galleon is shown by the fact that argosy is mentioned in two Shakespeare’s plays, ‘The Merchant of Venice” and ” The Taming the Shrew”. Nevertheless, customs and habits in language, architecture and culture travelled as much as the traders and merchants. From the end of the 13th century, cities on the Apennine peninsula became encircled by country-side palaces and gardens. This started a culture of country-side houses in its practical, ideological and cultural dimensions that flourished in the 15th century and would soon reach Dubrovnik. Summer houses with parks, terraces, fish-ponds, porches and chapels were built in Dubrovnik’s surrounding areas as early as in the 15th century. The aristocrats followed the new Renaissance comprehension of landscape, space and form. One of the oldest Arboretums in Europe can still be seen near Dubrovnik at Trsteno. 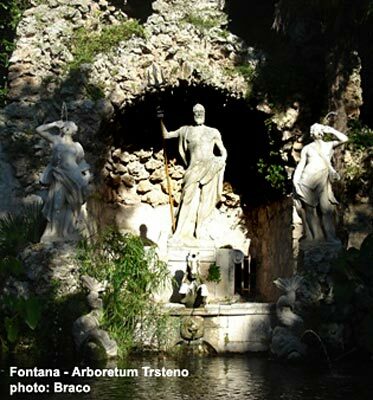 Left image: Part of the Arboretum in Trsteno showing Neptune’s fountain. Founded in 1492, the Arboretum contains exotic plants brought back by Dubrovnik’s merchant family Gozze. The seafaring family built up the garden by requested ship captains to bring back seeds and plants from their travels. Summer residences such as this were meeting-points for the city’s educated elite. The Arboretum demonstrates continuous development from Gothic Renaissance, Renaissance Baroque and Romantic forms to the present. It includes a Gothic Renaissance park surrounding the fifteenth century summer residence, which is a monument of garden architecture. The constant travelling meant that Dubrovnik was a busy port which frequently had visitors. In the 15th century, tourism first made its appearance in Dubrovnik. 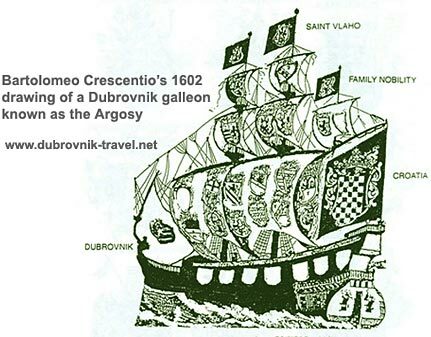 The first person involved in tourism in Dubrovnik was Gabriel de Armino, a trumpeter from Rimini. He had lived in Dubrovnik since 1458. In 1461 he obtained permission from the City Council to keep a hotel with five beds. The council claimed that such institution is necessary since many visit the City. During Dubrovnik’s golden age, its traders travelled as far as India. In Goa, India there existed a strong Dubrovnik colony around the Church of St. Blase.